Today we want to talk about Bona Fide Residence Test, which one shall pass to qualify for FEIE. 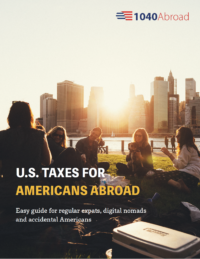 Are you an American abroad and you earn more than $10,000 USD a year? Then you are required to file U.S. federal tax return. If this is news to you, then you probably should know more about filing requirements for U.S. persons abroad. In order to help you understand more about U.S. international taxation, we prepare a weekly tax infographic. It’s an easy way to remember all that info needed! Today we gathered a few facts about Bona Fide residence test and also prepared you a free tool, which will help you to understand how one can pass the test or not. Do you still have questions? Do not hesitate to contact us to receive a free consultation. Our U.S. international tax professionals will help to determine your status and show you legal ways to save money. We also offer free 20 min call, when you can ask anything you would like to know about your tax case!